I’m the CEO of a mobile phone company. Here’s why I support net neutrality. The media sometimes imagines the battle for net neutrality as a fight led by swarms of passionate activists who are challenging greedy corporations like Comcast and AT&T — companies whose only motive is to find new ways to control and monetize the internet. As the CEO of a national mobile phone company and wireless broadband provider myself, I can tell you: That’s pretty much spot on. Net neutrality is the idea that people should be able to connect to whatever online services they like, using whatever devices they like, without interference or censorship from their internet provider. This simple idea is what made the internet a revolutionary technology — one that has launched new industries and helped topple dictatorships. It’s what makes the internet different than, say, cable television, where providers control exactly what content you can access. Net neutrality is the bedrock principle of the internet. Unfortunately, most broadband providers have fought against it in every way possible. Since the Federal Communications Commission (FCC) first tried to enforce net neutrality with “light touch” rules 10 years ago, big broadband providers have secretly throttled services, blocked mobile apps and spied on users. The FCC kept coming back with different variants on the rules, and each time big broadband companies would challenge — and defeat — the rules in court. After a decade of this, the FCC responded to widespread public pressure in 2015 and established strong, enforceable net neutrality rules under a solid legal foundation known as Title II. Title II treats broadband as a public utility, the same way the FCC has handled landline phone networks and wireless phone networks. Title II acknowledges the obvious reality that in today’s world, broadband internet is communication infrastructure vital to our democracy and economy. Winning Title II net neutrality was a victory for free speech and entrepreneurship over monopolistic businesses and their campaign contributions to politicians. That victory was won by consumer advocates, internet-based companies and millions of grassroots activists — fighting against the big broadband providers and literally no one else. But now, net neutrality is again under threat. Trump’s new FCC chairman Ajit Pai is trying to get rid of Title II, claiming that it has stifled investment and innovation. Again, as the CEO of a broadband provider and mobile wireless company, I can tell you that it’s just not true. Broadband networks have gotten faster. More people are online. Online services from Netflix to Snapchat have flourished. Americans have many more choices for unlimited mobile broadband than they did two years ago. The wireless company I run does not own its own networks, so we rent them from other broadband providers to offer service to our customers. We have to keep a close eye on the industry as a whole. The networks are healthy, competition is strong and our business is thriving. Contrary to the FCC’s claims, investment in broadband infrastructure has not stalled. In fact, publicly traded internet service providers (ISPs) spent 5 percent more on capital investment during the two years after the FCC’s decision than they did in the two years prior. In 2016, Comcast made $13.5 billion in broadband internet revenue, an 8.5 percent jump over the previous year. I have worked in wireless and engineering for the majority of my career, and I can tell you that the only reason anyone would want to throttle traffic on the internet is for profit — it’s not about performance and the cost to carry those bits. The cost of data falls every year, and that cost is built into ISPs’ margins. In other words, net neutrality is not hurting business. A future without net neutrality, however, would be bad for competition, consumers and democracy. We’ve seen what can happen when big broadband companies believe they are exempt from the rules. AT&T tried to block FaceTime on the iPhone unless customers paid for certain plans. T-Mobile throttles video quality for customers who don’t pay extra. All of the largest wireless carriers now exempt their own video content from data caps, putting other companies at a competitive disadvantage. This isn’t just a business issue. Without net neutrality, a rural internet service could block access to online calling services in order to force customers to also add phone service, making communications even more expensive for poor families. That’s not a hypothetical. A North Carolina ISP tried that in 2005, only to be blocked by an earlier version of open internet rules that big ISPs later sued to overturn. Many of the innovative apps that would be stifled by broadband providers could help facilitate civic engagement and free speech. For example, some newer messaging apps like Signal and WhatsApp offer users greater privacy protections — an important factor for many people concerned about the erosion of our civil liberties. Freed from the rules that prohibit blocking and throttling, big broadband companies could block or slow down access to political speech and websites they don’t like — without having to disclose that to anyone. That’s not how communications networks should work in a democracy. 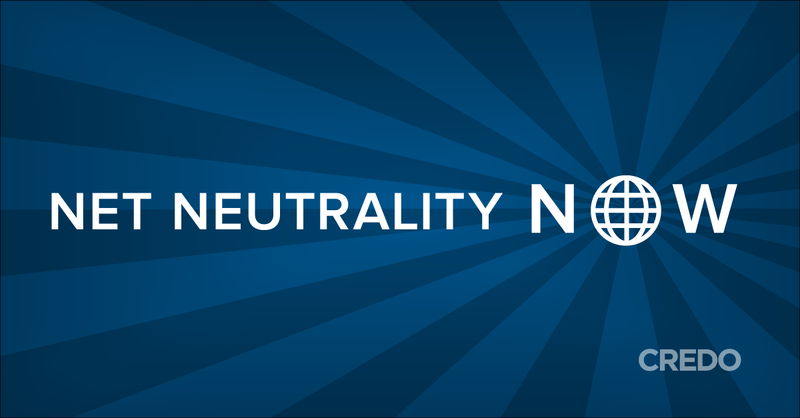 My company’s commitment to net neutrality is based on doing what is right for our customers and for our country. Our customers are active citizens who use the internet to demand change, advocate for issues that matter to them, and organize and speak out online. But because we rely on other companies’ networks, we cannot guarantee that net neutrality’s protections will always be there for our customers without strong, enforceable rules that apply to the entire industry. The internet has become the world’s most important communication system, driving job growth, civic participation and democratic discourse. The rules that keep it open need to be protected and enforced, not gutted to help big broadband companies make even more money. Ray Morris is the CEO of CREDO Mobile.